Since 1980, Paul Ratcliffe's list of credits have been varied and quite impressive. He works with numerous national and international publications, agencies, product manufacturers, and has received many prestigious awards for his work. For many years Paul's images were on display at the Greenpeace headquarter's store in San Francisco, and are presently being marketed in many aquariums, national parks, and retail outlets throughout the U.S., Europe, Canada, and Baja, Calif.
Thirty years ago Paul relocated from Southern Calif. to the Sierra Foothills, and accidentally became involved in the whitewater rafting photography business, which "rapidly" grew into a 1,000 sq. ft. shop-gallery with 15 employees. He and his staff have provided photos and entertainment for hundreds of thousands of tourists on river trips in Northern Calif. An accomplished guide and boatman, his assignments were sometimes varied, unusual, and quite challenging both photographically and physically. Twenty-seven years ago while on a Baja exploratory trip, he "refocused" his attention and career objectives during a shoot in the gray whale lagoons and became fascinated with these majestic creatures and the other species of the Baja region. With his love for the oceans, a carry over from 15 years of surfing in So. Calif., and the fascination with cetaceans, he has combined this with the photo opportunities and migrates every year along with the 22,000 gray whales and travels throughout the Baja region. Paul then discovered the regions of Alaska, British Columbia, Hawaii, the Caribbean, and spent time with the vanishing manatees in Florida. In his free time, Paul can be found in his zodiac or sea kayaking amongst his seal and otter friends in the Monterey Bay area. He also volunteers his time presenting educational slide shows in schools, organizations, clubs, and at special events. 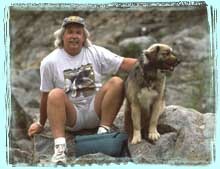 He has also presented his shows to many folks camped on the Baja beaches and in R.V. parks. He also attends as many shows, conferences, exhibits, and symposiums as his schedule will allow. Paul is an active member of the American Cetacean Society and has been invited three times to display his images at their Biannual Conference alongside such notable artists as Bob Talbot, Flip Nicklin, George Sumner, Larry Forster, Janet Biondi, Richard Ellis, and more. Not long ago he was also invited to participate by the Humane Society of the United States' symposium in their Seattle on whales and dolphins in captivity. Paul also feels that through his work he can bring joy and beauty to others and also have a direct impact on the conscience of everyone who views his images. He hopes they too will learn to appreciate and preserve our natural resources and wild "Ocean Friends".